Richard Macneil is proud to offer this high quality print from his recent collection of work. 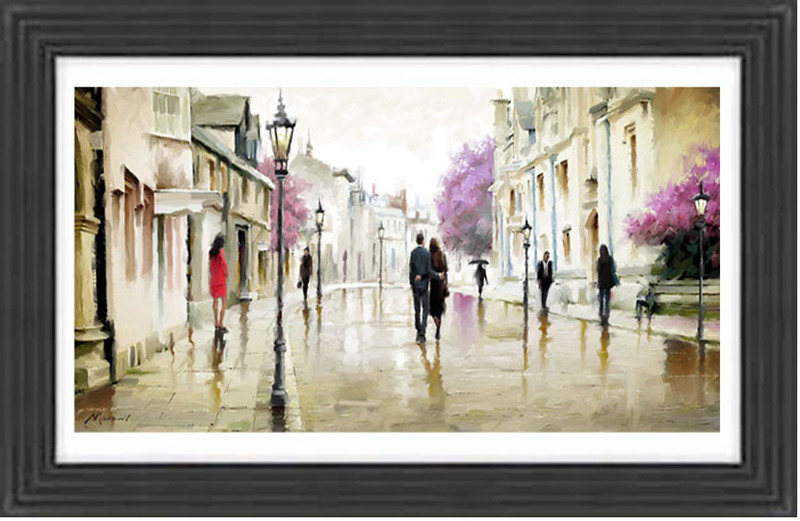 This particular print, "Afternoon Stroll", will compliment any interior, beautifully with its street scene inspiration which Richard loosely based upon Oxfordshire. Richard has achieved this stunning piece by using Sepia tones that are accented with dashes of red and hints of lilac. Light and reflection emphasise the detail within this artwork.This print is part of a pair which is also available to order via our print shop, (Stroll in the rain). However this art work still serves as a striking piece when individually displayed. This print has gained bestseller status within the range with the item in great demand- a testament to how truly beautiful this print is. Richard Macneil Framed prints offer a traditional means of displaying artwork . This particular print details a black frame with indentation grooves. The print is mounted on a white back ground which really enhances this artwork.